Laid down, 18 December 2008, at Northrop Grumman Ship Systems, Ingalls Operation, Pascagoula, MS.
585k Nas Bolton, a Northrop Grumman shipbuilder (inset), welds the initials of keel authenticator Ron Carlee onto a plaque during a ceremony for Arlington (LPD-24), 18 December 2008, in Pascagoula, MS. 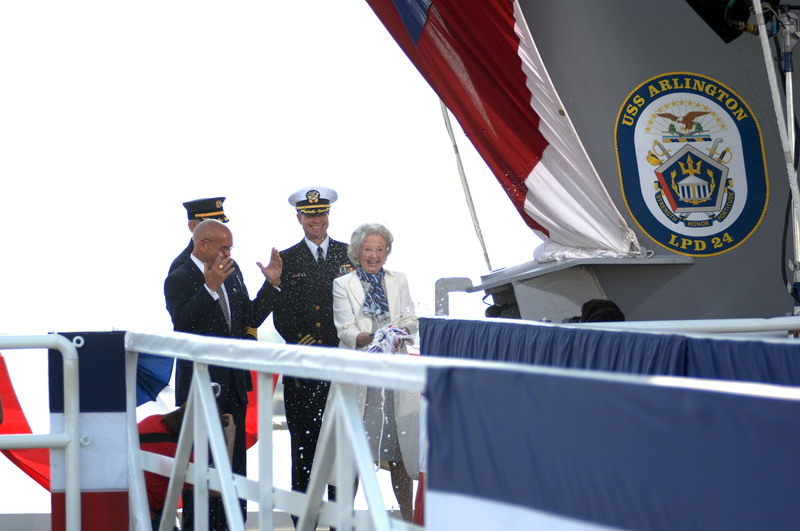 The plaque will be permanently affixed to the ship. 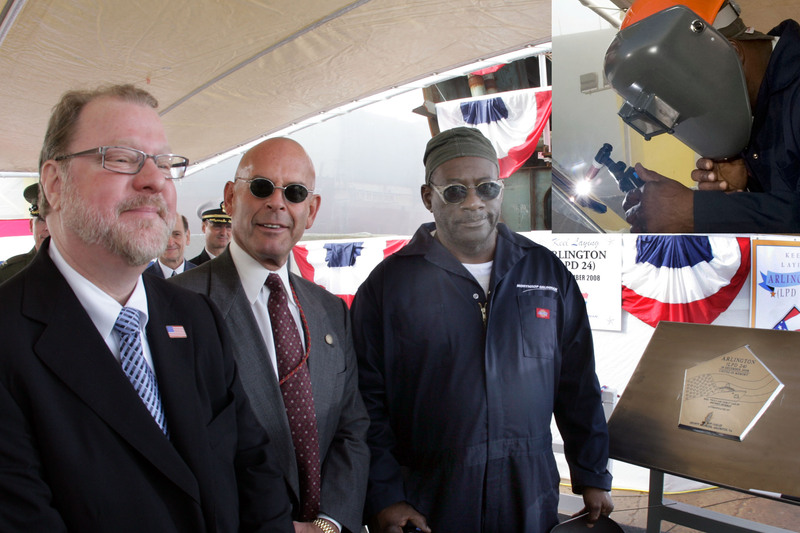 Gathered in front of the plaque are (left to right) Carlee, county manager of Arlington, Va.; Irwin F. Edenzon, vice president and general manager of Northrop Grumman Shipbuilding-Gulf-Coast and Bolton. 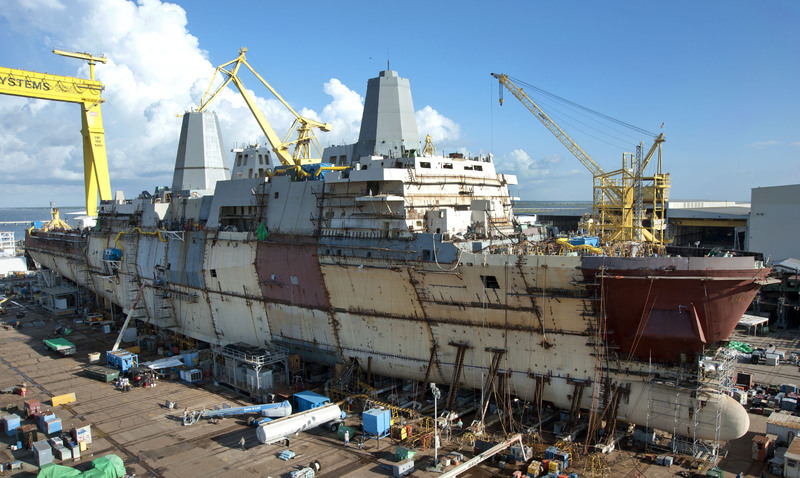 596k Arlington (LPD-24) on the builders ways at Northrop Grumman Ship Systems, Ingalls Operation, Pascagoula, MS.
651k Arlington (LPD-24) launching, 23 November 2010 from Northrop Grumman Shipbuilding's Pascagoula shipyard, marking a key milestone in the ship's construction process. 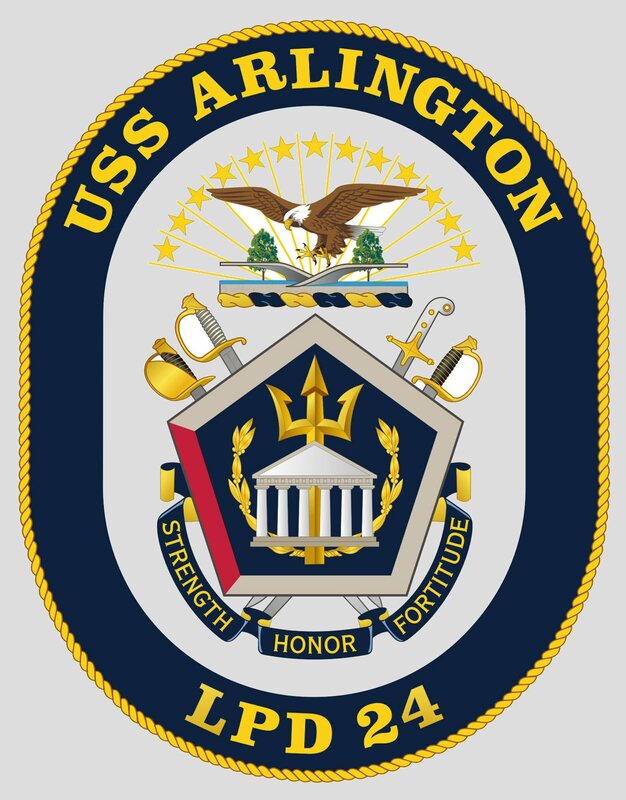 Arlington honors the 184 victims who died when American Airlines Flight 77 crashed into the Pentagon 11 September 2001, as well as the first responders from the county. 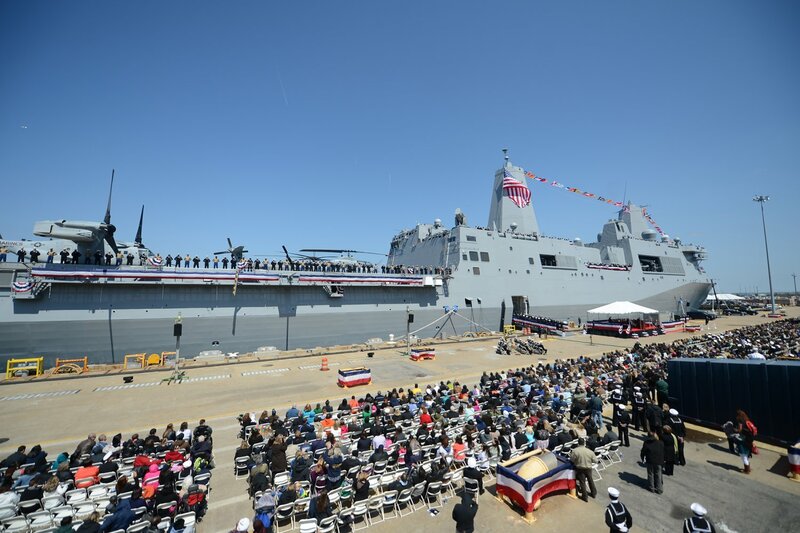 957k Joyce Rumsfeld, wife of former Secretary of Defense Donald Rumsfeld, christens the amphibious transport dock ship Arlington (LPD-24) at Northrop Grumman shipbuilding in Pascagoula, Miss. 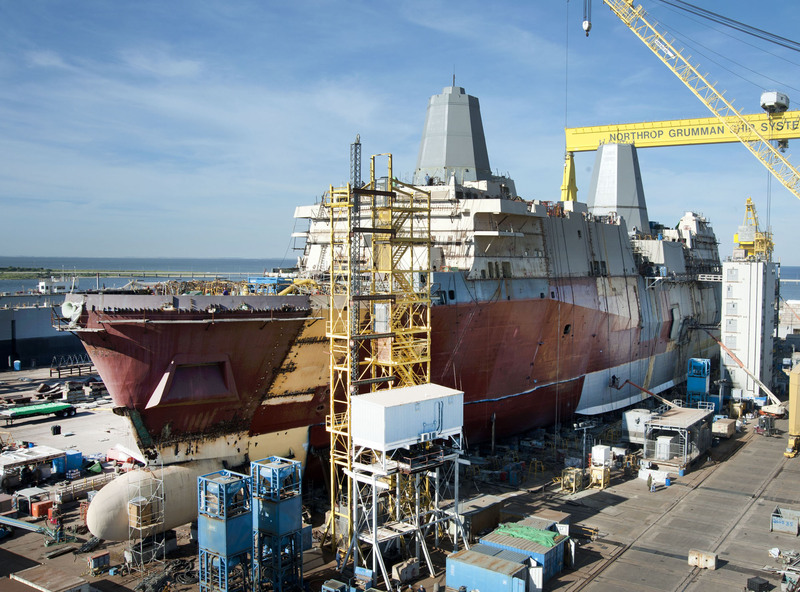 1799k Arlington (LPD-24) moored at Ingalls Shipbuilding Corp., Pascagoula, MS., far left, as America (LHA-6) is launched, 4 June 2012. 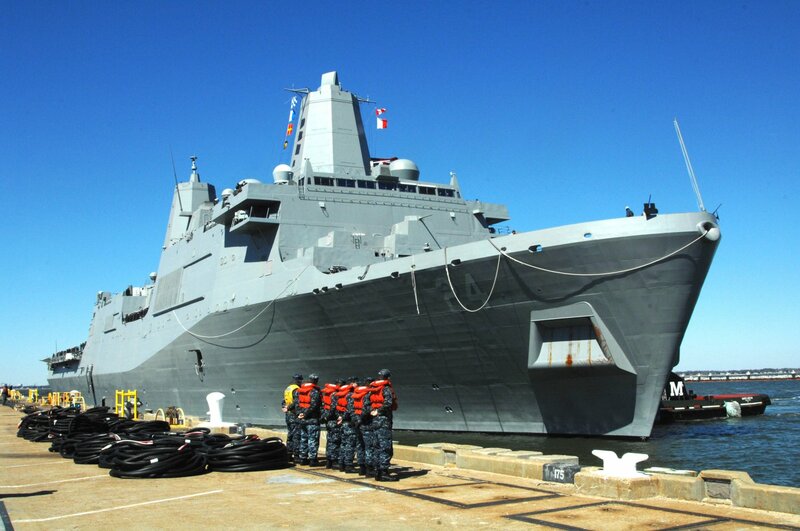 245k Arlington (LPD-24) is positioned at her berth at her new homeport of Naval Station Norfolk. 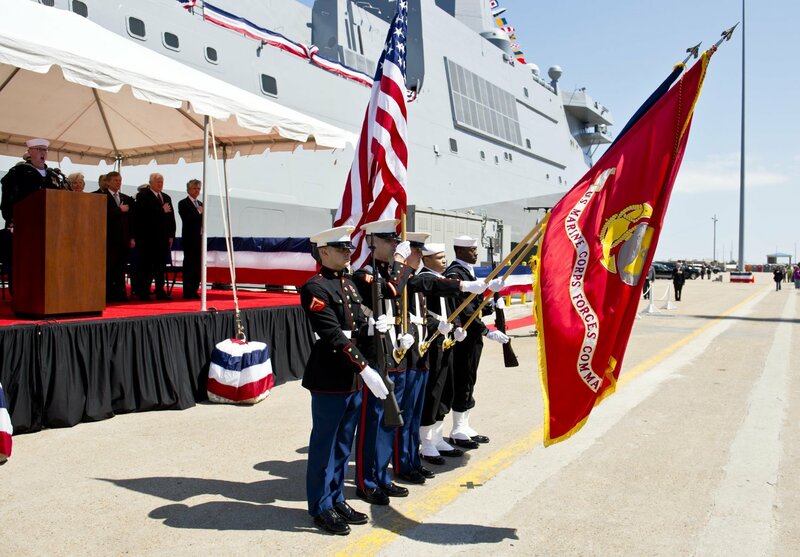 297k The color guard parades the colors during the commissioning ceremony of USS Arlington (LPD-24) at Naval Station Norfolk. 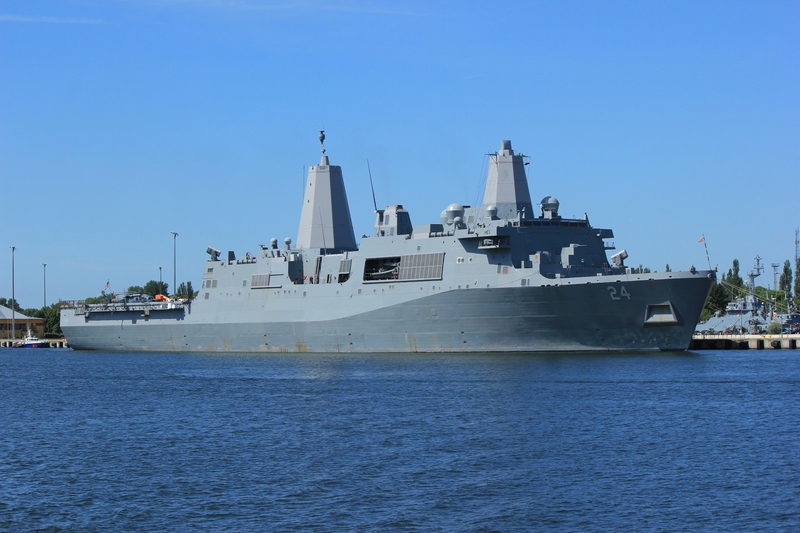 As the third Navy vessel to bear the name, Arlington commemorates the lives lost and the heroism demonstrated the aftermath of the Sept. 11, 2001 terrorist attacks. 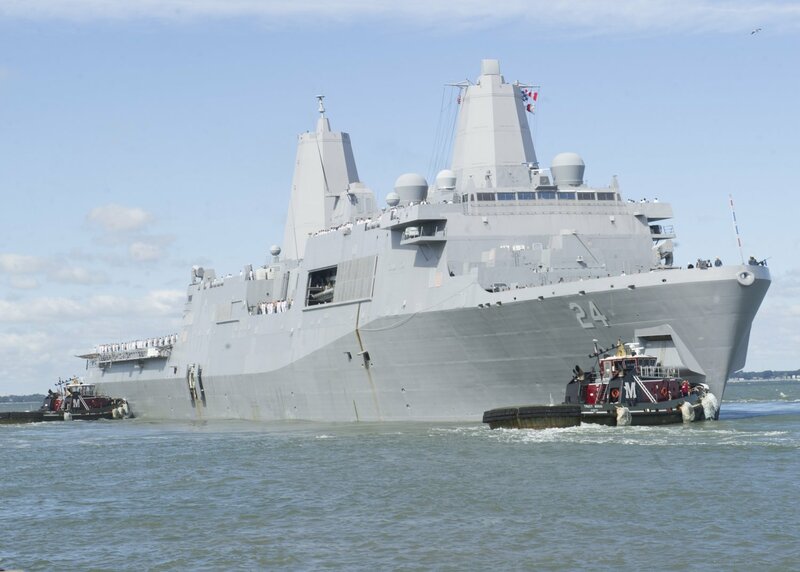 275k Sailors and Marines assigned USS Arlington (LPD-24) man the rails and bring the ship to life during her commissioning ceremony at Naval Station Norfolk, VA.
342k Sailors assigned to USS Arlington (LPD-24) recover an Orion capsule into the well deck of Arlington as part of NASA's first key Orion stationary recovery test at Naval Station Norfolk. 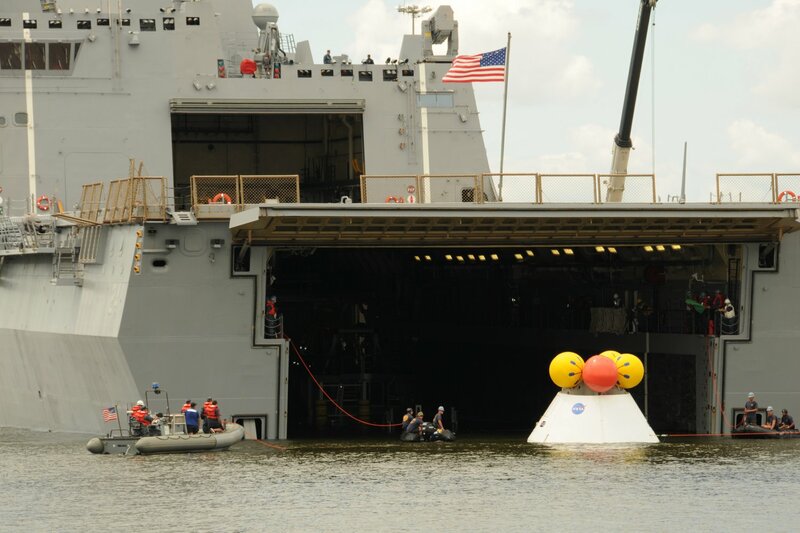 NASA is partnering with the U.S. Navy to develop procedures to recover the Orion capsule and crew after splashdown. 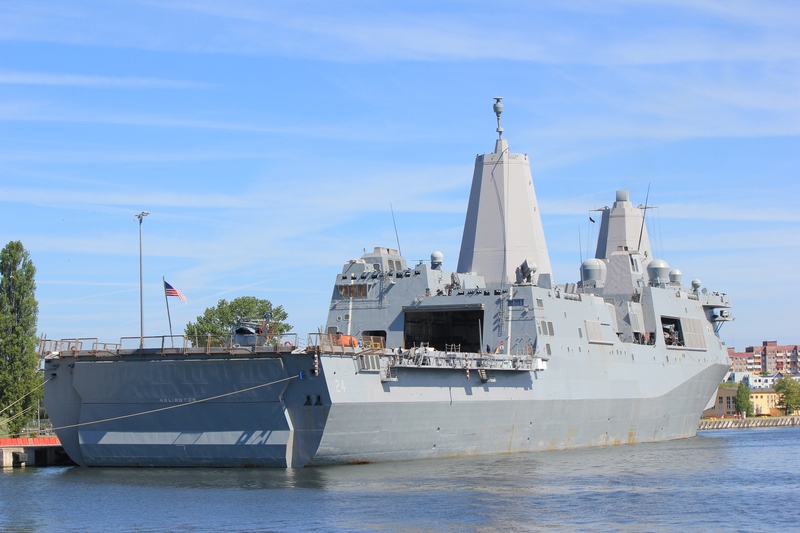 218k NASA engineers, Navy divers and Sailors assigned to USS Arlington (LPD-24) tow a test Orion capsule into the well deck of Arlington. 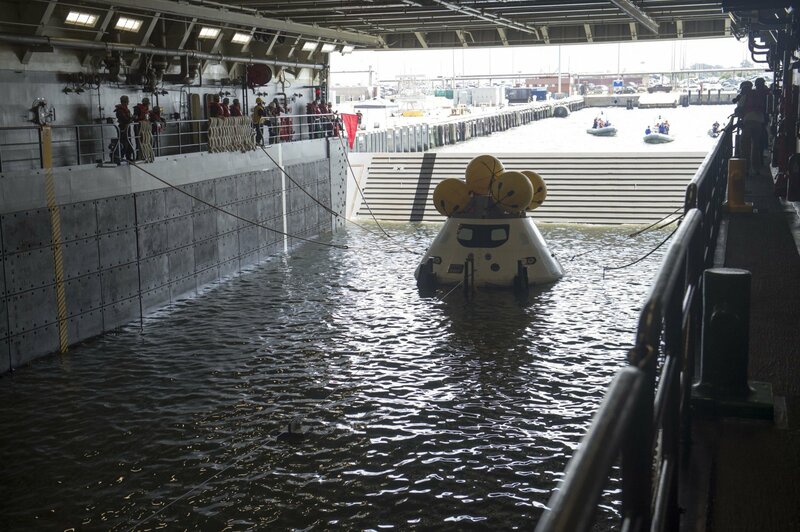 This phase one test determined the best method for recovering the capsule after earth reentry and splashdown in the ocean. 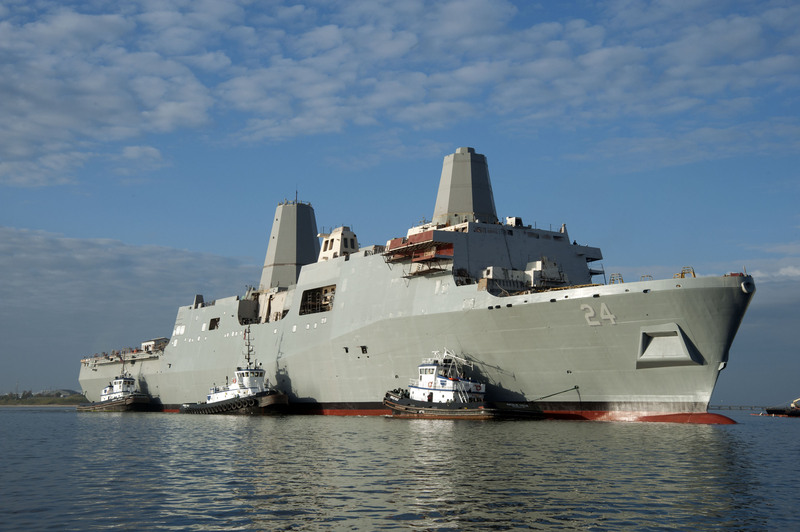 252k USS Arlington (LPD-24) participates in training exercises with the amphibious assault ship USS Iwo Jima (LHD-7). 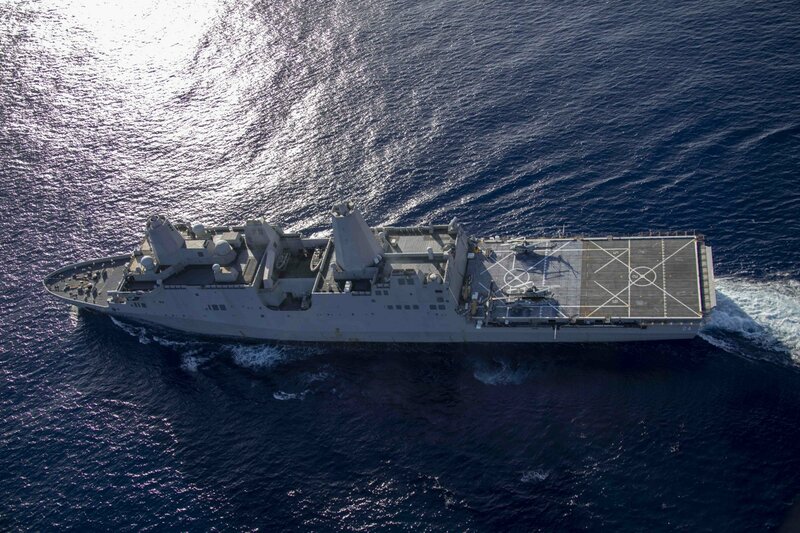 Iwo Jima is underway conducting amphibious integration exercises. 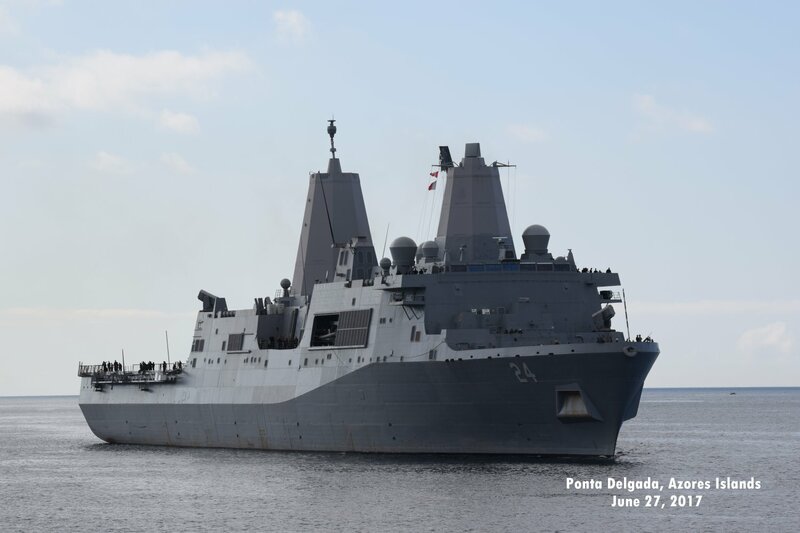 272k USS Arlington (LPD-24) under way with the Kearsarge Amphibious Ready Group (ARG) and the 26th Marine Expeditionary Unit participating in ARG/MEUEX, a scenario-based amphibious integration exercise, in preparation for a future deployment. 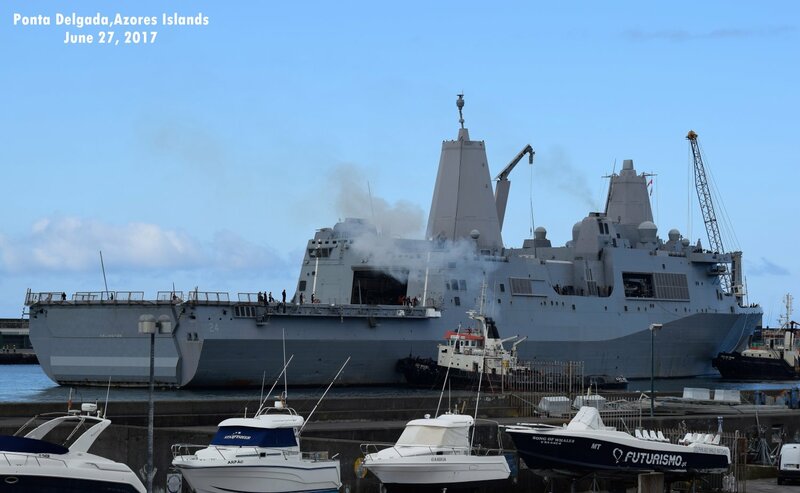 184k Sailors and Marines man the rails aboard USS Arlington (LPD-24). 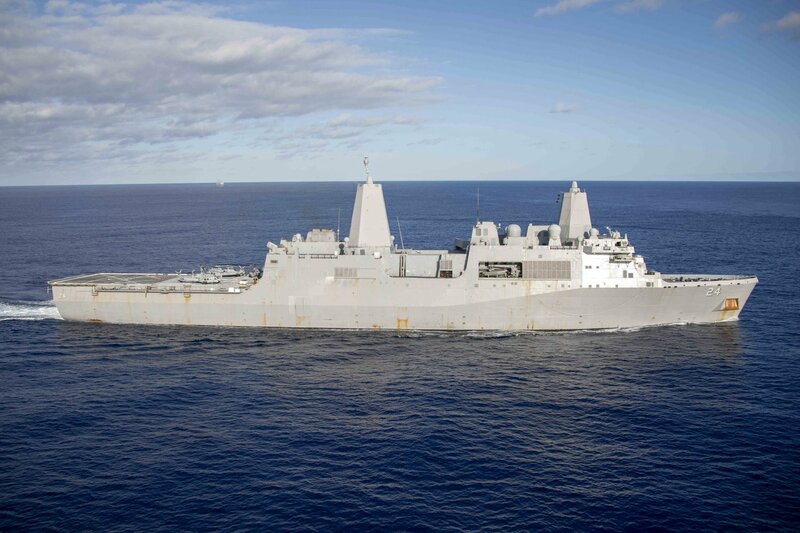 Arlington deployed as part of the Kearsarge Amphibious Ready Group in support of maritime security operations and theater security cooperation efforts in the U.S. 5th and 6th Fleet areas of responsibility. 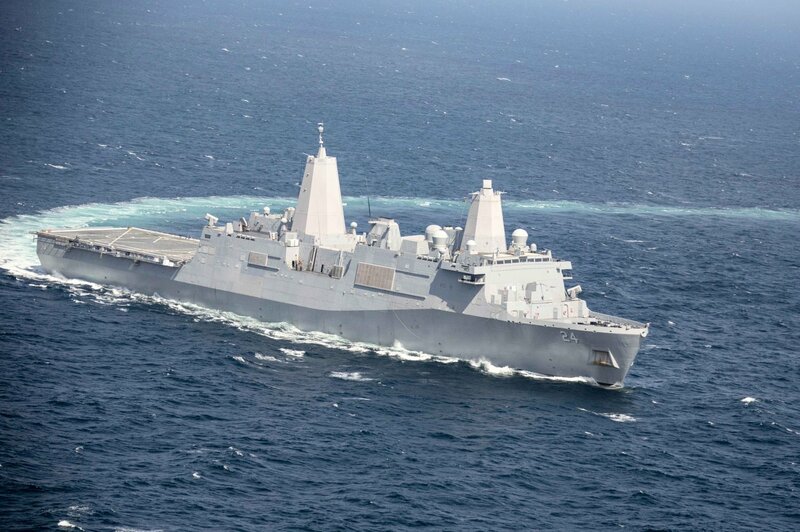 181k USS Arlington (LPD-24) transits the Suez Canal. 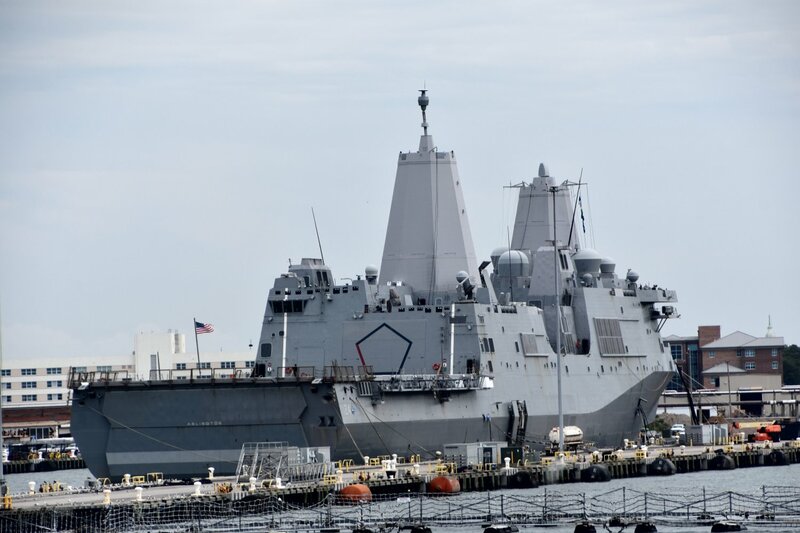 Arlington is part of the Kearsarge Amphibious Ready Group (ARG) and, with the embarked 26th Marine Expeditionary Unit, is deployed in support of maritime security operations and theater security cooperation efforts in the U.S. 5th Fleet area of operations. 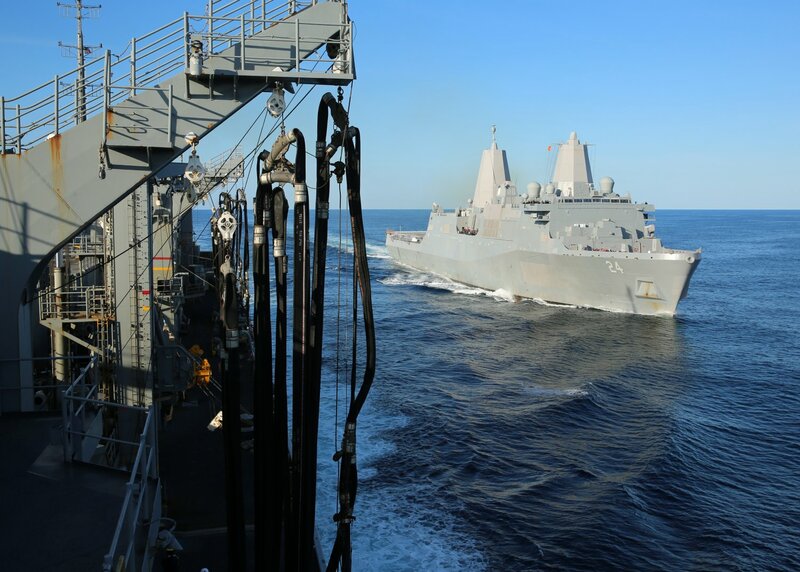 324k USS Arlington (LPD-24) comes alongside the Military Sealift Command fast combat support ship USNS Arctic (T-AOE 8) to receive fuel and cargo delivery training during an underway replenishment at sea. 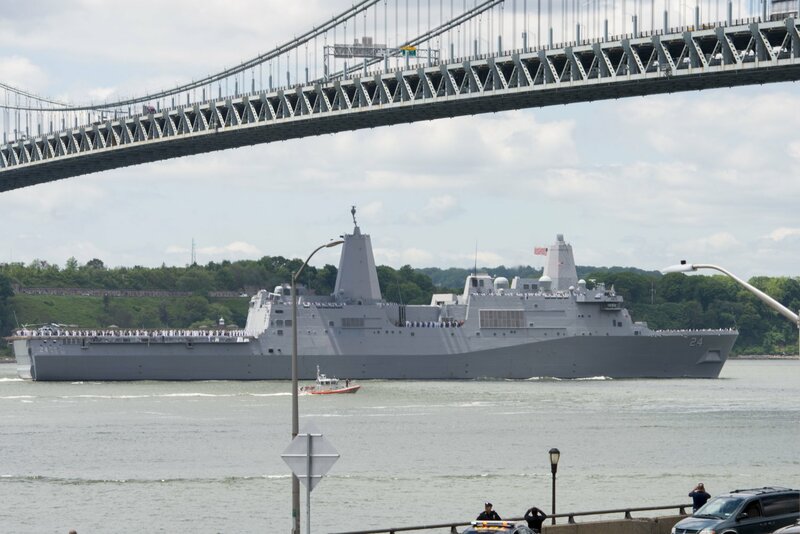 NEW YORK (May 23, 2018) 229k Sailors and Marines man the rails of USS Arlington (LPD-24) as the ship arrives in New York City for Fleet Week New York (FWNY) 2018. 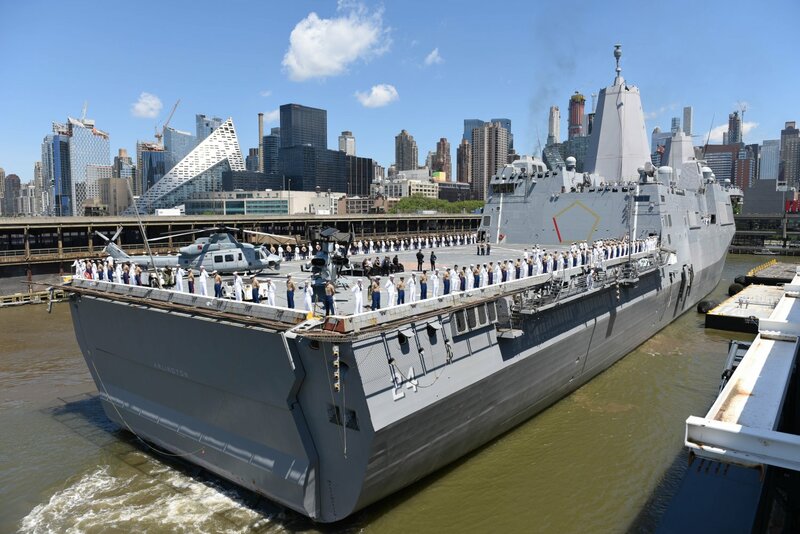 FWNY is the city's time-honored celebration of the sea services and is an unparalleled opportunity for the citizens of New York and the surrounding tri-state area to meet Sailors, Marines and Coast Guardsmen, as well as witness the latest capabilities of today's maritime services. 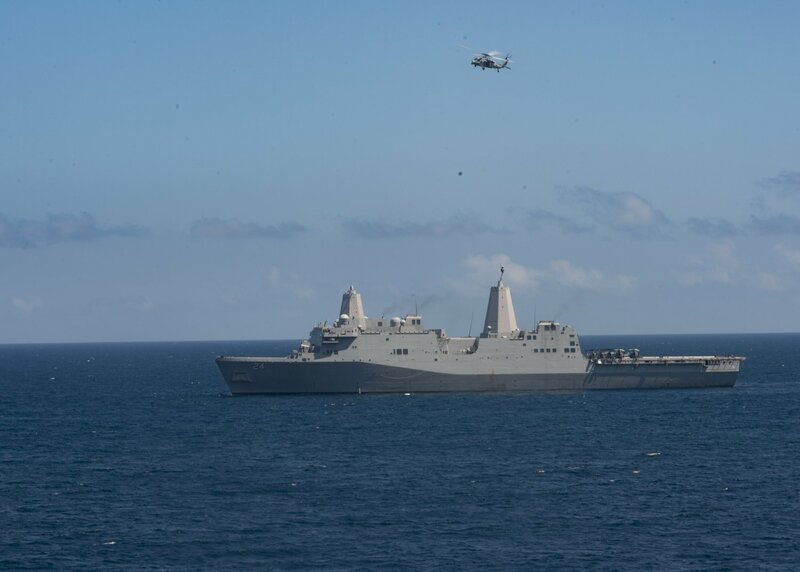 339k USS Arlington (LPD-24) under way in the Atlantic Ocean as part of the Kearsarge Amphibious Ready Group conducting routine certifications to maintain unit readiness. 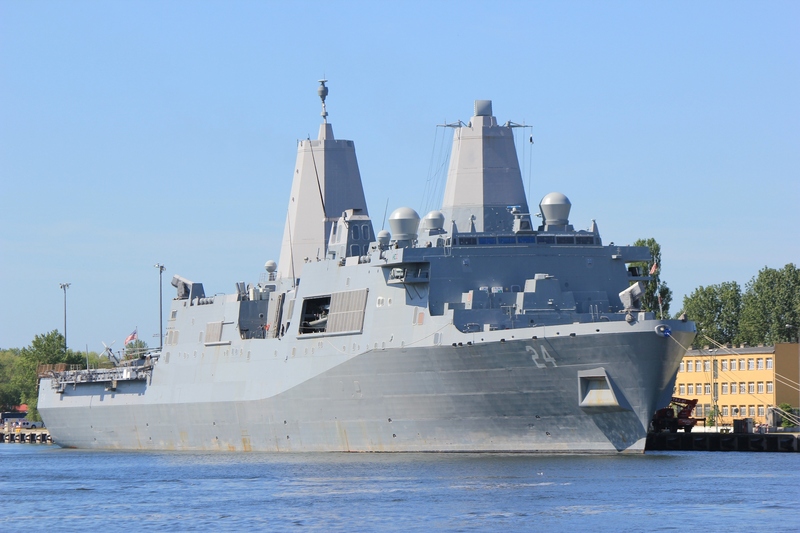 142k USS Arlington (LPD-24) participates in Carrier Strike Group (CSG) 4 Amphibious Ready Group, Marine Expeditionary Unit exercise (ARGMEUEX). 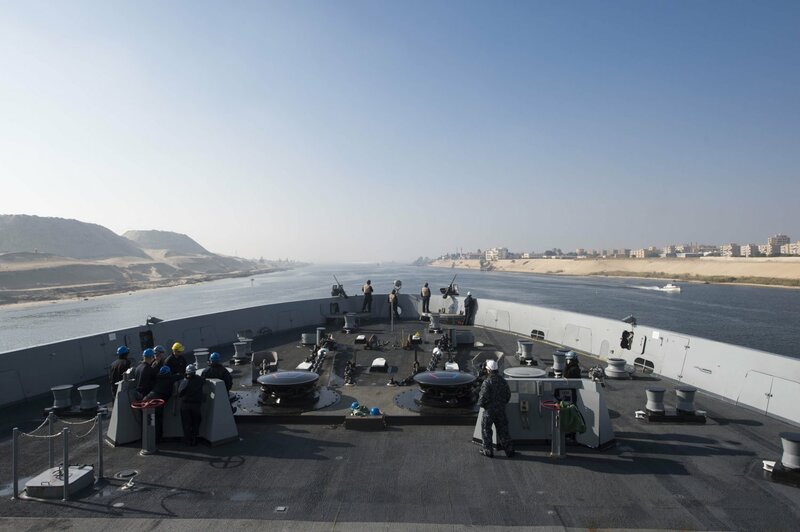 Kearsarge Amphibious Ready Group and 22nd Marine Expeditionary Unit are enhancing joint integration, lethality and collective capabilities of the Navy-Marine Corps team through joint planning and execution of challenging and realistic training scenarios. 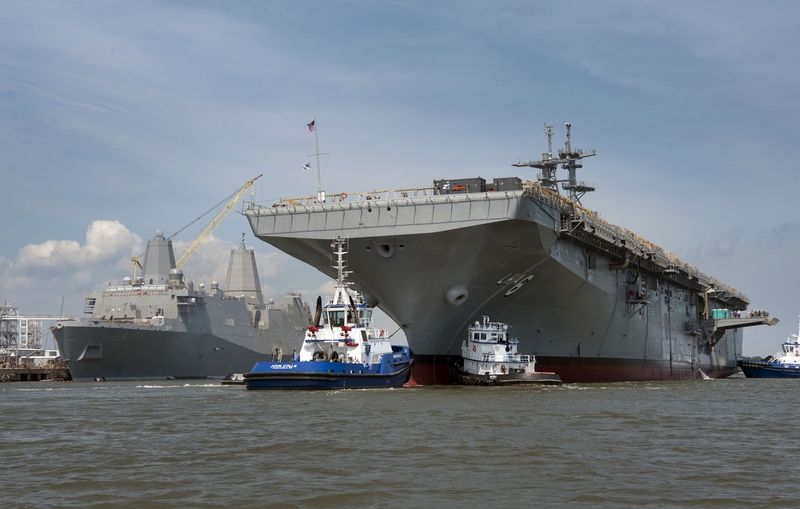 CSG-4 mentors, trains and assesses East Coast units preparing for deployment. 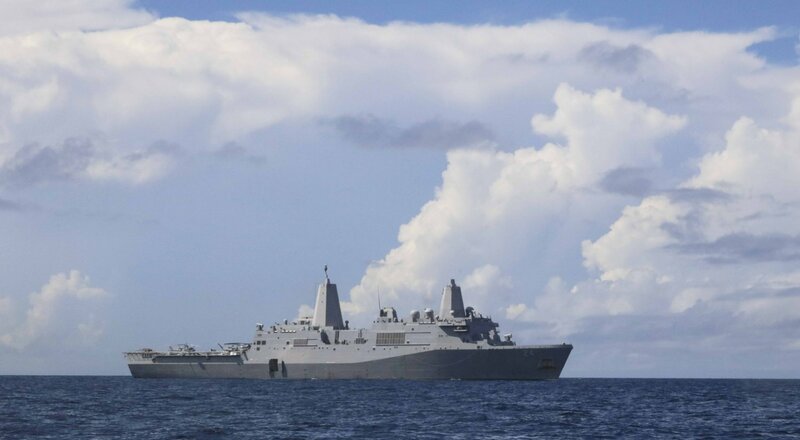 122k USS Arlington (LPD-24) participates in a visit, board, search and seizure (VBSS) drill during the Carrier Strike Group (CSG) 4 Amphibious Ready Group, Marine Expeditionary Unit exercise (ARGMEUEX). 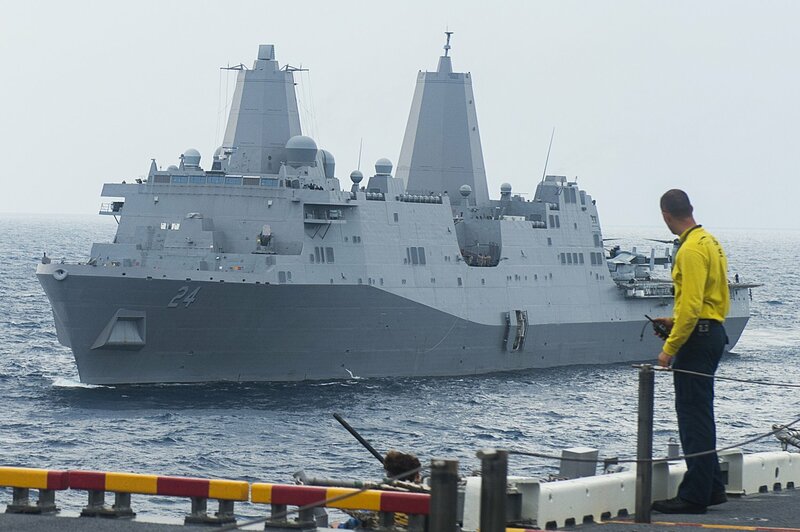 Kearsarge Amphibious Ready Group and 22nd Marine Expeditionary Unit are enhancing joint integration, lethality and collective capabilities of the Navy-Marine Corps team through joint planning and execution of challenging and realistic training scenarios. CSG-4 mentors, trains and assesses East Coast units preparing for future deployments. 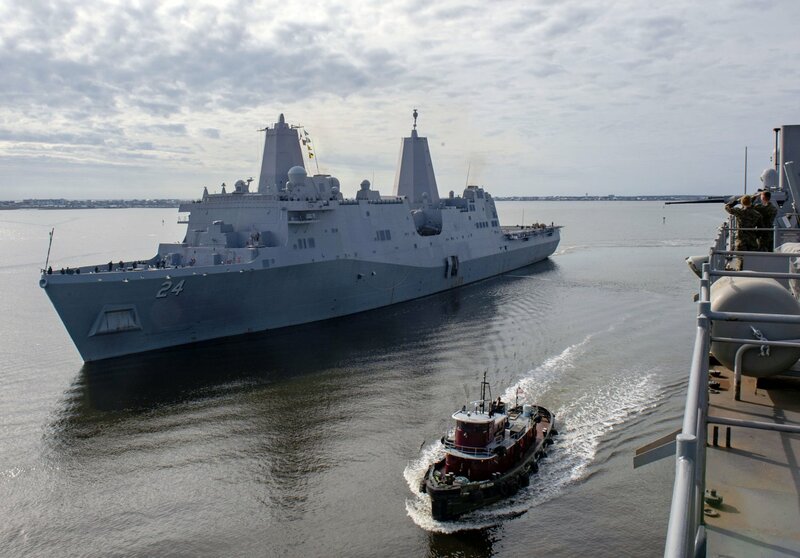 258k USS Arlington (LPD-24) gets underway from Morehead City, N.C. Arlington is deploying as part of the Kearsarge Amphibious Ready Group in support of maritime security operations, crisis response and theater security cooperation, while also providing a forward naval presence. 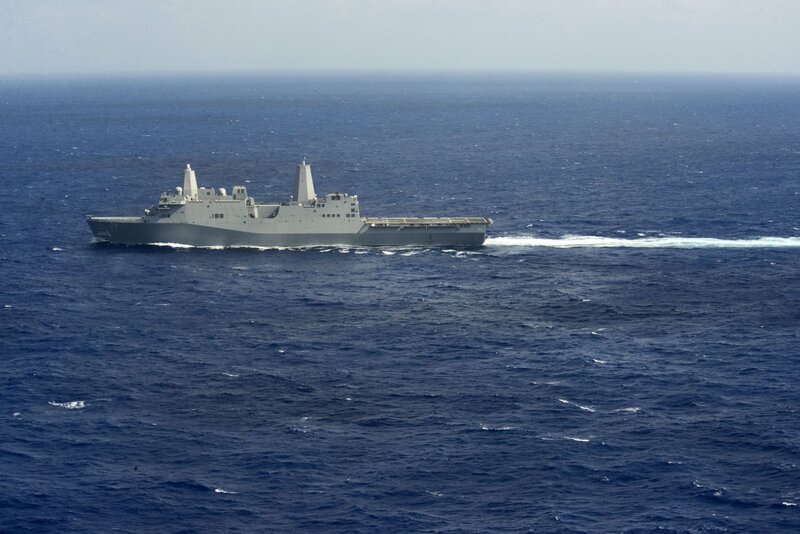 181224-N-JN023-0543 466k Overhead and starboard broadside views of USS Arlington (LPD-24) as she transits the Atlantic Ocean. 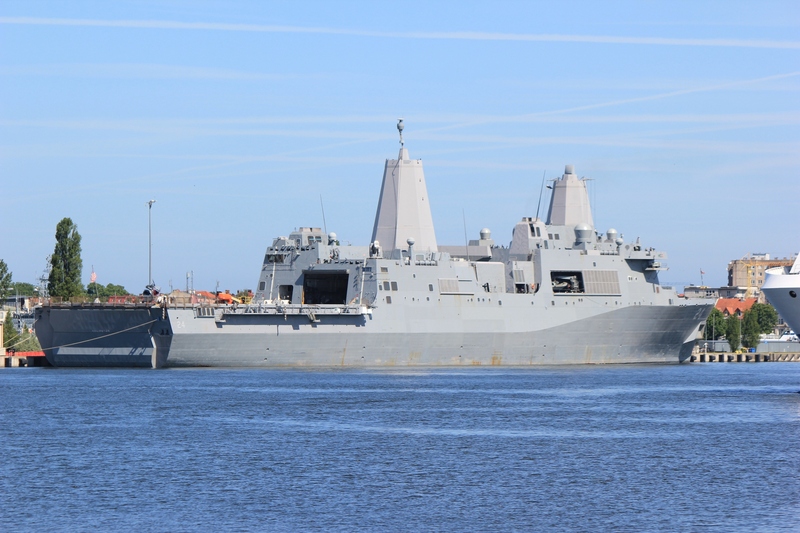 Arlington is deployed as part of the Kearsarge Amphibious Ready Group in support of maritime security operations, crisis response and theater security cooperation, while also providing a forward naval presence.